Ownership / Access: Historic Scotland. Opening times: Check their website for more info. Price of admission: Check their website for more info. Notes: Tantallon Castle is a semi-ruined mid-14th-century fortress, located 5 kilometres (3.1 mi) east of North Berwick, in East Lothian, Scotland. It sits atop a promontory opposite the Bass Rock, looking out onto the Firth of Forth. The last medieval curtain wall castle to be constructed in Scotland, Tantallon comprises a single wall blocking off the headland, with the other three sides naturally protected by sea cliffs. Tantallon was built in the mid 14th century by William Douglas, 1st Earl of Douglas. It was passed to his illegitimate son, George Douglas, later created Earl of Angus, and despite several sieges, it remained the property of his descendants for much of its history. It was besieged by King James IV in 1491, and again by his successor James V in 1528, when extensive damage was done. 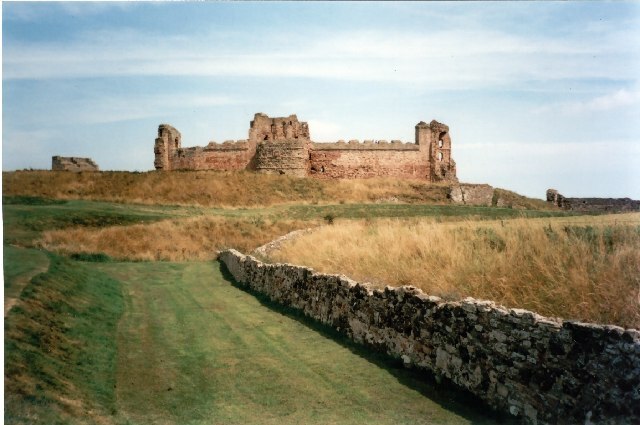 Tantallon saw action in the First Bishops' War in 1639, and again during Oliver Cromwell's invasion of Scotland in 1651, when it was once more severely damaged. It was sold by the Marquis of Douglas in 1699 to Hew Dalrymple, Lord North Berwick and the ruin is today in the care of Historic Scotland.